Clenbuterol – a drug used in the treatment of bronchial asthma and obstructive pulmonary disease. The tool has a bronchodilator effect and helps to stop spasms that occur in these diseases. "Clenbuterol" for ingestion is in the form of tablets and syrup. Adults and children 12 years of age use the product 2-3 times a day. Single dose of "Clenbuterol" tablets 10-20 mg (0.5-1 tablet). A single dose of the syrup is 15 ml. With severe bronchospasm, the daily dose may be increased to 80 mg. During maintenance therapy the drug drink twice a day 10 ml (ug). The content of active substance in 1 ml syrup and 1 mg tablets equals. Children to take "clenbuterol" should be 2 times a day. Single dose depends on the age of the child. For small children it is advisable to provide means in the form of syrup – this form is more convenient to use. Children up to 8 months prescribed by 2.5 ml, with 8 months to 2 years – 5 ml syrup "clenbuterol". Children 2-4 years should be given 7.5 ml/micrograms, 4-6 years - 10 ml/mg of the drug per dose. Single dose for children 6-12 years - 15 ml/µg means. The duration of treatment is 2-3 days. This period is sufficient to eliminate acute symptoms. Maintenance therapy usually lasts for 1 week. The exact dosage and duration of treatment should be determined by the doctor. For conducting inhalation 4-7 drops of "clenbuterol" was diluted in 3-5 ml of saline or distilled water. The drug should be inhaled for 5-10 minutes using a respirator. To carry out this procedure for adults and children 6 years of age. 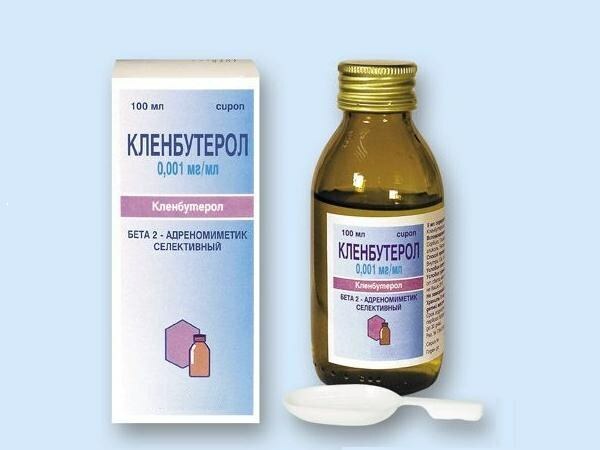 Treatment of "Clenbuterol" is contraindicated in thyrotoxicosis, tachycardia and arrhythmia, aortic stenosis and myocardial infarction and other heart diseases in the acute stage. The drug should not be administered to people with individual intolerance of its components. Syrup is not recommended in diabetes. You should not use "clenbuterol for weight loss because side effects from high doses of the drug have a negative impact on the heart. The drug can cause relaxation of the muscles of the uterus, therefore its use during pregnancy, especially in the first trimester and before the birth is contraindicated. Also "clenbuterol" should not be used during lactation. In the case of urgent need to treat you inhalatory form of the drug. In the treatment of "Clenbuterol" possible side effects such as cardiac arrhythmias, changes in blood pressure, General weakness, headaches, anxiety. There may also be tremor, muscle cramps, skin reactions, bronchospasm, angioneurotic edema, stomach pain, dry mouth. On the occurrence of any reactions to medication should be reported to your doctor.